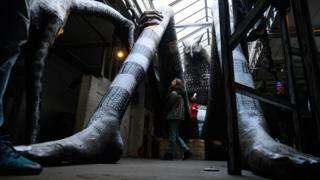 For the past six weeks, an abandoned cutlery factory in Sheffield has become the final resting place for a group of giant mythical creatures. And thousands of people have flocked to pay their respects, queuing for up to four hours to see them. 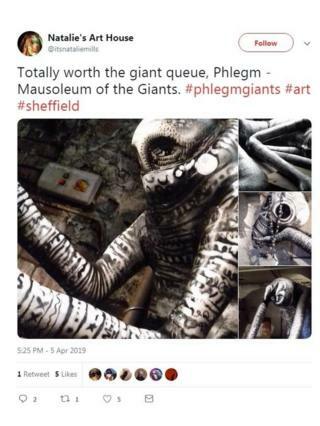 The ancient creatures are actually sculptures created by a street artist called Phlegm for the exhibition, titled Mausoleum of the Giants. And it was a big hit - 12,000 people visited before it ended on Saturday. 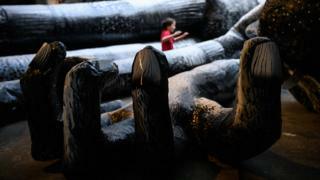 "We have had people from New York, from Italy, from Norway come over just to see the show," according to Tamar Millen, from Sheffield City Council, who helped organise the exhibition. "People drove up from Plymouth for the opening night, people drove down from Dundee. It's just been astounding. "We're so glad people have put the effort in to wait. The first Saturday and Sunday we were open we had freezing rain and people still queued for two-and-a-half or three hours. It was quite amazing." 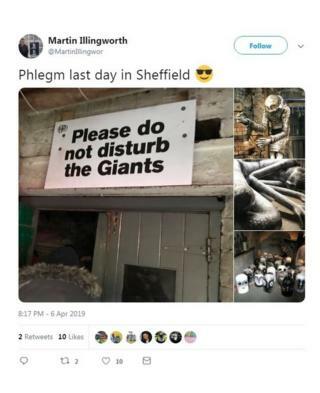 Phlegm, who was born in north Wales and moved to Sheffield in his teens, keeps his real identity anonymous. 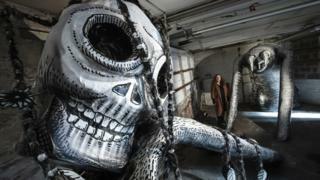 He's known for his murals around the UK and around the world, including in New York, Toronto and Melbourne. 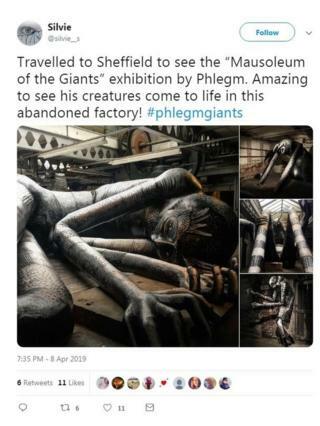 He was approached by Sheffield City Council and the University of Sheffield to create Mausoleum of the Giants. Despite its popularity, they couldn't extend the exhibition because work is now beginning to convert the derelict factory into flats. 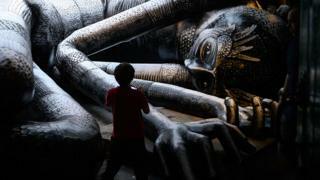 Phlegm's giant creatures were said by a press release to be thousands of years old and "have seen rivers erode and mountains change". They came to rest in the factory's central courtyard, corridors and five rooms. "It's a melancholy, quiet feeling," Tamar Millen said. "This is their final resting place. In each room are more characters that are here to say goodbye to each other. "We've had people come back to queue two or three times at different times of day to see it in different lighting. "People have been overwhelmed. There's a 'wow' moment as you come down the corridor into the main room and you get to meet the giants for the first time. People stand there for quite a while just taking it in. "Everybody has been absolutely amazed - firstly that it was free, because we had Arts Council funding, and secondly that it happened here in the city." Follow us on Facebook, on Twitter @BBCNewsEnts, or on Instagram at bbcnewsents. If you have a story suggestion, email entertainment.news@bbc.co.uk.